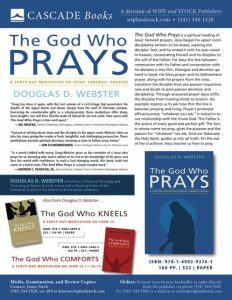 The God Who Prays is a forty-day meditation on Jesus’ farewell prayers. This is our third and final meditative journey into Jesus’ discipleship sermon. This study follows the The God Who Kneels (John 13) and The God Who Comforts (John 14 – 16:22). There is an escalating challenge in Jesus’ discipleship sermon. Each successive phase requires us to think deeper and prayer harder. There comes a time when we need to let go and move on from our old inquiries, doubts, and hesitancies. Like the disciples we need to shift out of training mode and move into mission. A move made possible only by the grace of Christ.